Cha family men are not that great drinkers. They are worse in state when they are drunk. Hence, one shouldn’t be involved with them when they’re drunk. Never ever try. Nevertheless, the Cha cousins are beyond cute when Mu-Won tries to stay sober by mixing his soju with Coke while Ji-Heon goes “Ahhh~ ahhhh~” in his aegyo voice every time he empties his glass. Try replaying this scene for several times like me and you may end up copying Ji-Heon. I already did that. Behind their fights and competitions, they are secretly wishing that they can be as close as before. Like what Na-Yoon said, their circle of friends only include herself, Ji-Heon, and Mu-Won. Mu-Won takes every chance he has to bug Ji-Heon while Ji-Heon keeps yelling at his annoying cousin. But secretly, he also longs for him and even strokes his picture so lovingly. Awww. I really want both of you to make some alliance or something. That would be really pretty. Na-Yoon-ah, you really deserve a pat on the head or on the back. Let Ji-Heon do that for me. I’m loving Na-Yoon. So much until I keep wishing she’ll appear more in the upcoming episodes. She didn’t even came out in the first episode, so it’s sort of a make up for that. She’s so far the most sensible second female lead I’ve ever seen, athough quite comical and childish. People are not that happy with Eun-Sul right now: either they are not liking her condition right now, or they just being plain jealous at her for being the center of attention of two gorgeous guys. She’s a woman full of sensibility in herself and she surely knows what’s the best for her and people around her. Put yourself in her shoes: she’s being careful not to hurt the people who are precious to her. Mu-Won gives her a new work, while Ji-Heon gives her a new experience of life. It’s pretty hard to hurt them, right? So what she’s doing right now is just giving them their chances to realize the reality themselves without having to hurt them. When the time comes, as adults, both Mu-Won and Ji-Heon will realize what is the answer that they’re waiting from Eun-Sul: who does she loves more. Ji-Heon is just being plain romantic all the way. I’m practically swooning over him every time he’s with Eun-Sul. He’s doing everything he can and slowly, he’s maturing at his own pace. And almost every time he’s trying his best, my tears will come involuntarily. It’s like watching your child finally learning to be independent. I bet that’s what Eun-Sul is feeling during this scene. There’s so many times that I am really getting ready to spill my tears but it turns into laughter instead. It’s Ji-Heon who makes me cry, but he’s also the one who makes me burst into laughter. Insanely adorable, that’s an appropriate description of him. They are so cute! i almost want them to get together or something. No, if they reconcile and stay like close friends is enough for me. Chairman Cha looks like he wants to be friends again with Suk-Hee but she’s too geared up for the company and her son. At least, they are trying hard not to fight every time they have meals together, especially in front of Grandma. I love their shared sentiments about being a single parent to two grown up sons, although Chairman Cha is not that clear about this. So that’s why the children are behaving like kids, their parents are like teenagers. Suk-Hee and Curator Hwang, Na-Yoon’s mother are another pair that I love to see. Well, they are not that kind, but their expressions when they are being chided by Grandma are so hilarious. Suk-Hee is funnier when she’s with Chairman Cha, but Curator Hwang is amusing when she’s dealing with her Na-Yoon. I’m wondering what will happen if Mu-Won is really going to end up with Na-Yoon. There are two options: they can either be friends or fighting in-laws. (They look like a creeping ghosts LOL) I’ve just read the written preview for episode 11 and looks like Ji-Heon is withdrawing himself from liking Eun-Sul…or not? Oh, please don’t! I really really want them to be together! And no one is leaving to go anywhere, pretty please! Hey, thanks for mentioning my blog! Yes, I do remember that comment I made – I’m so glad my wish came true – he wore black AND changed his hairstyle. Hahaha! About Moo Won and Ji Heon – I do agree with you that they actually like each other. Unfortunately, they can only relate to each other right now by fighting. Any kinda touchy feely conversation would be majorly weird for the both of them. In episode 10 – have you seen it – Ji Heon tried to be a little warm to MW but was rebuffed. I felt quite sad for JH then because he was trying, but he had to mask his concern by being gruff. 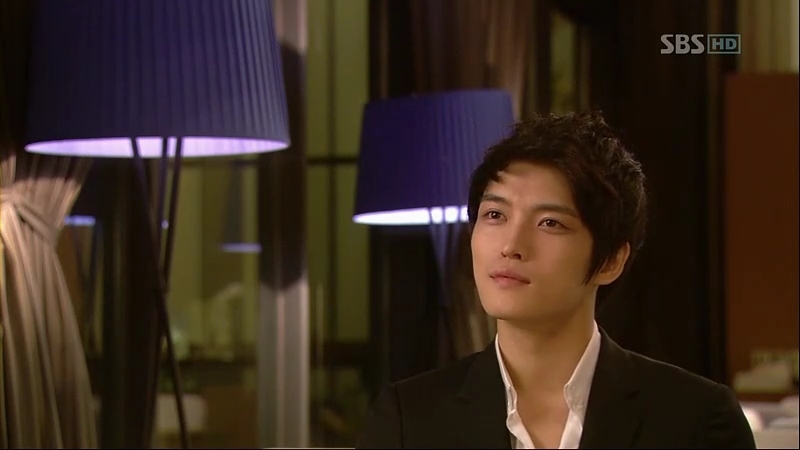 Unfortunately MW misinterpreted JH’s remarks as gloating, so didn’t react well. I do hope the cousins join forces one day. Both of them running the company – that would be ideal! I really want MW and JH to be close again~ Sometimes I really hope that someone else would get the Chairman position and ends all the quarrels. I even pictured NY and ES as the chairman 😀 And both MW and JH keep their current positions, working with each other in harmony! 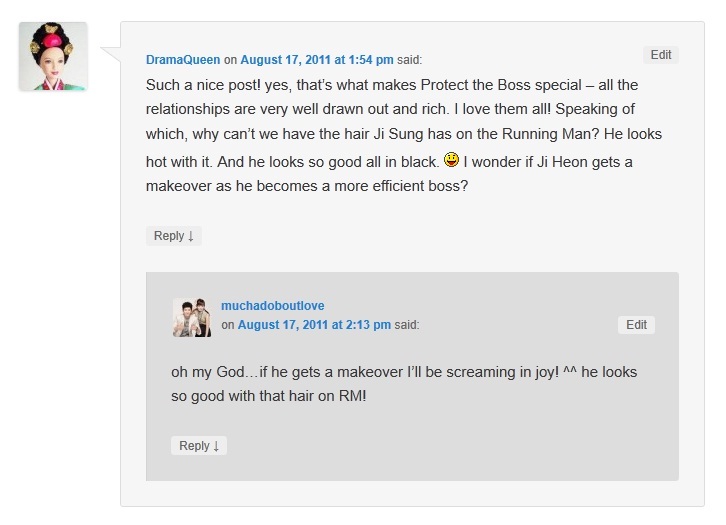 Our wishes were heard by the stylists and the Kdrama Gods, apparently. Yay for Ji Sung in black! 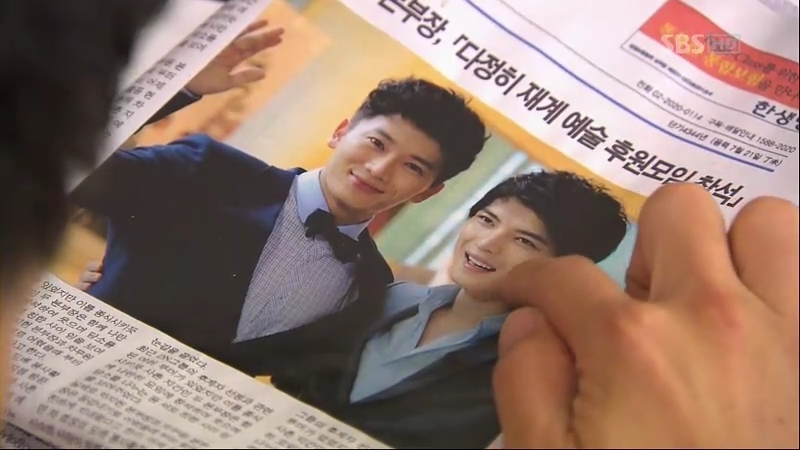 they need to, plus another one for JJ~ haha! LOL, yes JJ brooding in the shower over ES. How perfect! I’ve been watching the movie right now, and I find it very funny, wich makes me laugh because of their dorkie slank they use.